Peirce College is also featured in our ranking Top 25 Most Affordable Online Bachelor’s in Accounting. Designed for professional and working students, Peirce College offers degree programs that work around the busy schedules of those students. One of the more popular programs available through the college is its Bachelor’s in Accounting program. The college allows students to transfer credits they earned into the program and to gain credit for their professional experiences. Students also have the option of enrolling in an online accounting program that allows them to do work during the school week and to sit in on lectures that occur a few times a week. The college expects students to complete a minimum of 121 credits of work. At least 42 of those credits come from its institutional requirements and are courses that students in other programs take. Those classes include Speech Communication, Application of Software Fundamentals, English Composition and College Algebra. There is also a one-credit course that students take, which introduced them to the college and to what the school expects of them in the future. Accounting majors must also take 26 credits of required accounting and business classes. Students will take standard courses such as Accounting Principles, Intermediate Accounting I and II, Managerial Accounting and Computerized Accounting. They will also take business and finance classes that include Operations Management, Human Resource Management and Introduction to Finance. Peirce College students can also take a Cooperative Experience class and get three credits for work that they do in the accounting field. They can work for a top accounting firm or for a finance department. The college allows students to take an elective instead of doing a cooperative experience. Students will also take an Accounting Capstone. Peirce College requires that accounting majors take this course because it will help them develop better research skills and stay on top of accounting trends and topics. Peirce College is a private institution in Pennsylvania that offers opportunities for both traditional and nontraditional students. Established in 1865 as Union Business College, it offered programs designed for Civil War soldiers who wanted to go back to school. Thomas May Peirce, the founder of the college, decided to focus on business programs because he wanted to help students take advantage of the growing industries in and around Philadelphia. The college changed its name to the Peirce School of Business Administration after building a new campus in the 1910s and then became Peirce Junior College in the 1960s. This also led to the college adding standard degree programs and offering associate’s degree programs. It wasn’t until the late 1990s that the college added bachelor’s programs. The college has a strong reputation today as a school for adult and nontraditional learners. While students can enroll in classes right out of high school, it also accepts those who have a GED and students who have some work experience. Students can earn degrees in different fields as undergrads or enroll in one of the college’s two graduate programs. Peirce also offers a handful of online programs for students who cannot attend traditional classes. Though all programs offer classes during three semesters each year, some programs follow an accelerated format. Instead of taking 14-week classes each semester, students enroll in shorter classes that run for seven weeks at a time. The accelerated programs allow students to complete more work in less time. 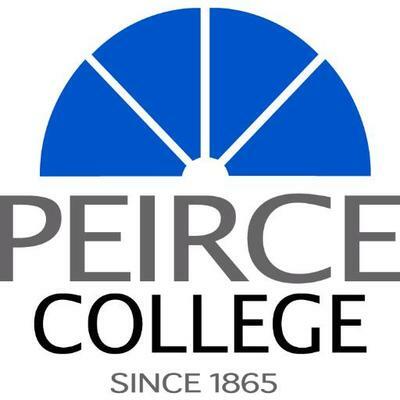 More than 1,800 undergrads enroll in Peirce College every year. The Middle States Commission on Higher Education (MSCHE) granted regional accreditation to Peirce College, which gives students the right to fill out the FAFSA. This financial aid form uses students’ tax records or their parents’ tax records and determines whether they qualify for aid from the federal government and the state government. MSCHE accreditation also applies to transfer credits and allows students to transfer the credits they earned at another university or college. Peirce also has accreditation from the Accreditation Council for Business Schools and Programs (ACBSP) that covers all its business programs and its accounting degree programs. Students must choose the type of application that describes the type of students they are when applying to the college. Peirce offers an application for new students who will take classes on its Pennsylvania and an application for online learners. As the college has rolling admissions, students can submit their applications whenever they want instead of feeling forced to follow a strict deadline. They will submit their applications online and pay a $50 application fee also. Incoming students must take several placement exams also. These exams allow students to show the skills they already have and helps the college determine where they should start in different fields, including English and math. Some students may need to take more prerequisite courses than other students do, and some students can skip those courses entirely. Peirce encourages students to spend at least one day a week preparing for those tests. The college accepts most students who apply and does not have many application requirements. It allows students to take lower level classes to develop the same skills that their peers have before beginning a full degree program. The college will accept those with a high school diploma and those who have a GED. Students can use the Peirce College net price calculator to determine exactly how much they will pay each semester. The college also offers information online that lets current students know when it will increase its tuition. Undergrads pay $600 per credit hour, which brings the total cost up to $1,800 per class. The college also allows students to earn course credits for certain exams that they take and for their past work experiences. Those students will pay $350 to earn credits. The college has financial aid specialists working in its financial aid department that can help students fill out the FAFSA and answer any questions they have about their aid packages. Students will get a letter that explains their individual packages within a few months or less of completing the FAFSA. Undergrads attending the college receive federal aid in the form of loans and grants. They can borrow more loans after finishing their first years. There is a work-study program open to students who need more financial aid too. Peirce College will accept any external aid that students receive also.